What does Pinterest have to do with fairy gardens? If you are not a ‘Pinner’ then you just don’t understand! Slide over there and put in a search term for fairy gardens, fairies, gnomes, fairy doors, fairy houses or what have you and you will soon see that Pinterest has everything to do with fairy gardens and miniature gardens. I am a member of quite a few groups that find things to say about fairy gardens. Social media groups, webrings, networking groups – in fact what ever group I can find that has anything to do with miniature gardening in general and fairy gardening in particular. It’s my business after all. And these groups are great , have good content and the means to start a conversation with other people in them. 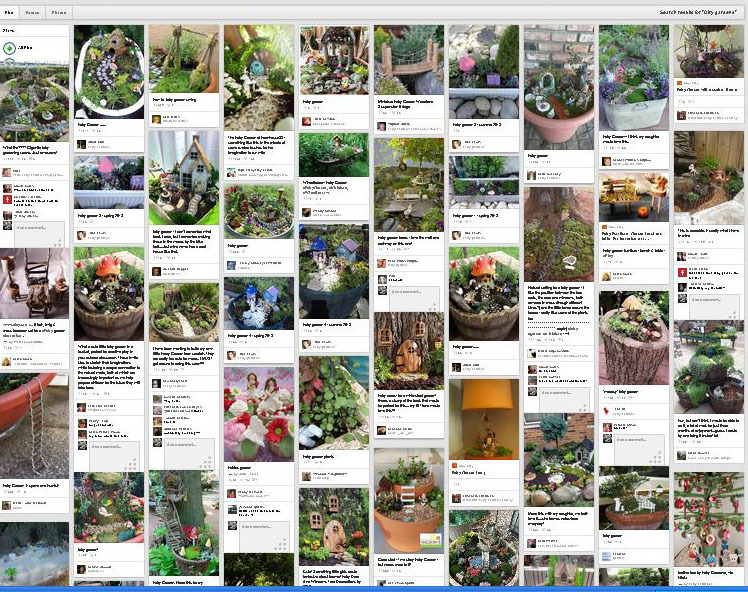 Pinterest, however, is the eye candy queen of the world for fairy gardens. Micro, mini, full scale, outside, inside, in a tree, on a boat, you name it Sam I am. Its there! Bar none the best place to find interesting new ideas and inspiration. Although you can’t message other people on Pinterest many photos link back to places where you can connect – or – find a group. Some link back to blogs, other photo gallery sites, stores and people. In short the content is rich with discovery. And Pinterest isn’t monetized yet so no paid ads. They are looking at ways to monetize the site in the future. For now they have Pinterest for Business with some handy features, blogs, how-tos and some widgets for your site or Blog beyond the simple Pin It button. One of their newer features for business helps you adjust your sites product photos to include product, store and pricing information when they get Pinned from your site. Pin your site photos your self to a Pinterest board of you’re own and if it’s unique or interesting or just plain cute watch it fly around Pinterest getting collected on other ‘pinners’ boards where they share it with their friends both on and off Pinterest. And maybe they will ‘Follow You’ becoming an audience for your future Pins. One day last week I did a search in Google images for ‘polyclay gnome’ and presto – there was one of my pictures recently loaded up to Pinterest. The URL and link to my store was displayed and still embedded. The immediate source was listed as another ‘Pinner’. Pinterest shows up in your Google Analytics under Referrers in Aquisition>Social. You can see how much traffic it is generating directly and you can determine the quality of that traffic by looking at the various other information attached – things like average bounce rate, time on site, and how many pages viewed. Pinterest is my number one Social acquisition stat over Twitter, Facebook, LinkedIn, and my other groups. It also out performs the many business directories I’m listed in all put together! But even if this wasn’t the case I’d still be there to keep an eye on what my customers are finding that fires them up, to get inspiration for craft ideas and just enjoy the eye candy. This entry was posted in Reflections and tagged fairy garden business, fairy gardens, Pinterest for Business by Marthe Hook. Bookmark the permalink.